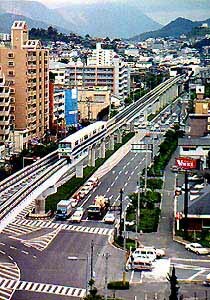 After the Tokyo-Haneda system opened in 1964, no new Alweg-type monorails were built in Japan until the Kitakyushu City Monorail opened in 1985. Hitachi has been busy since installing similar track all over Japan and elsewhere. After the Tokyo system was built, the Japanese Monorail Association was formed and it established standards for both straddle and suspended monorails in Japan. One of the new standards for straddle monorails was that passenger cabins must be entirely above the bogies, which allows a flat floor from the front of the train to the rear. Although the exterior width is close to earlier Alweg trains like Seattle and Tokyo, the interior is much more spacious with flat floors and sideway facing seats only along the train walls. The end result of the Japanese standards is a much taller train, and in this case a much boxier looking design. Trains for later systems have introduced a bit more streamlining. What sets this monorail apart from the earlier Japanese lines is the liberal dose of landscaping along the road medians below the guideway. In some areas the appearance of the guideway is that it is supported by the trees that have grown up beneath it. There are many areas where steel guideway is used for long spans. Both concrete and steel beams can be seen in this image taken by TMS President Kim Pedersen. A large station is visible in the distance. Visit our Special Features page for a seven-page photo essay on the Kitakyushu Monorail.